HOPCOMS (Horticultural Producers’ Co-operative Marketing and Processing Society Ltd) was established to help farmers to sell their products. They connect farming community and the consumers. They are based out of Banagalore. They have hundreds of stores in five districts of Karnataka – Bangalore Urban, Bangalore Rural, Kolar, Ramanagar and Chikkaballapura Districts. Like many Bangaloreans I buy my fruits and vegetables from HOPCOMS. I love them. For sometime I have been thinking about how to make them more accessible and visible. One of the idea was to build some alerts. 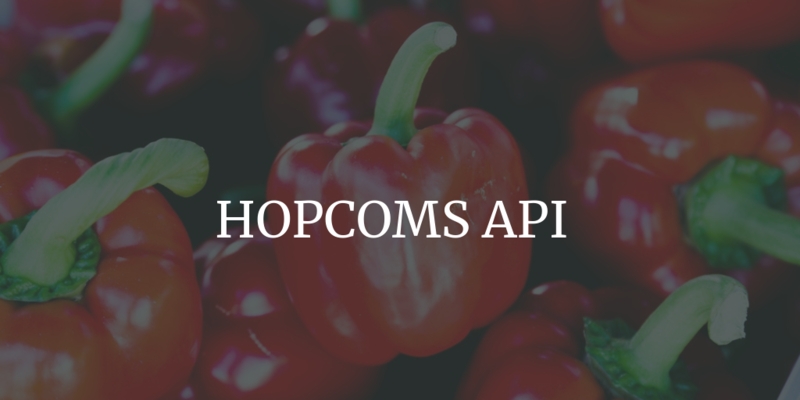 HOPCOMS as such doesn’t have any APIs1 on which I could build things. But they had a web page where they publish the daily rates. Well I took it upon myself to build an API so others can use it too. It also reduces burden on HOPCOMS servers. All in all serves HOPCOMS, Consumers and Farmers. There are two ways to use the API. Use the code provided and run your own. Or email me and get access to my small API server. Data is hosted on CouchDB. APIs are simple CouchDB restful APIs. For the external world it’s mostly GET access only. All responses are in JSON format. Do remember the returned Content-Type is text/plain even though the information returned by the request is in JSON format. To get the content-type application/json set need to explicitly set your request Accept header as Accept: application/json . Assuming CouchDB runs at https://mycouchdb.ext there are two databases available. This stores the daily rate data. The primary key _id is date in the YYYYMMDD format. For example Jan 16, 2018 will be 20180116. It’s accessible at https://mycouchdb.ext/hopcoms_daily/20180116 with a simple GET. The response data is JSON and is simple key:value pair of item_code and rate. You could do other CouchDB key based queries to get data worth of a month or year or between specific dates etc. See queries section for some examples. So using both you can figure that on 20180116 rate of Apple Delicious was INR 110. It’s that easy. Its better to cache the item_details in your application environment. It’s the last time daily rate was updated. So gives you an idea how update the data is. I do host the version of API where I run the server and maintain it. As of now its running on a small server and hence not public. Email me, I will send the access details. You can host it yourself. All you need is CouchDB, ability to run python programs and CRON for scheduling. I am going to explain the broad steps. Install CouchDB, make it web accessible or may be use hosted CouchDB from IBM Cloud. Whatever works for you. This is not the best place for it. Create hopcoms_daily and hopcoms_meta databases. Setup auth etc. You can keep track of what I am working on here. I have TODO list. This API documentation was last updated on Mar 14, 2018 @ 2:13 PM. Contact me using the email or contact form for any feedback or comments.